Sanitation and avoiding cross-contamination are concerns in any food processing plant, and managers do everything possible to avoid it. From in-depth handling procedures to floor sprays at each door, many steps are taken to ensure the quality and safety of the food products being handled. An important factor in avoiding cross-contamination and improving sanitation factors is the role your employees’ Personal Protective Equipment (PPE). When making decisions about the equipment your employees wear, their safety and comfort are top considerations. But you also need to consider how their boots, jackets, and other gear can help you enhance sanitation and avoid cross-contamination as well? The outersoles and boot material can play vital roles in your sanitation and anti-cross-contamination efforts, as well as help with productivity, employee satisfaction, and your bottom line. Cross-contamination is often the result of carriers. A pathogen carrier can be water and other liquids, air as well as work apparel, like boots and gloves. For example, an operator’s boots may inadvertently come into contact with the potential source of contamination, so what they are wearing and how easy they can be cleaned is extremely important. To improve sanitation, the outer material of the boot’s uppers needs to be made of a smooth, non-porous surface. You will also want to avoid boots with laces or Velcro closures because these materials can become carriers. The material the boots are made from needs to protect your employees and avoid becoming carrier, but they also need to stand up to frequently exposure to water and other chemicals used to clean them1. If the material of the boots can’t handle the chemicals you use, the boots will break down faster – it is important to know what materials best withstand the chemicals you use for sanitation (see chart below for a guide to our processing boots’ chemical compatibility2). 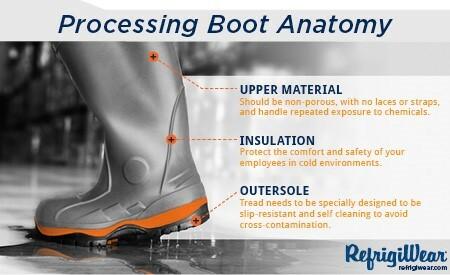 The outersole/tread of the boot needs not only to be slip-resistant, but make cleaning as quick and easy as possible. Before moving from one area to another, an employee needs to clear out the tread to avoid becoming a carrier for cross-contamination. Self-cleaning tread that is resistant to foreign material adhering to the ridges is a huge plus in these environments. Even if your boots’ exterior helps you avoid cross-contamination and remain durable through many cleanings, your employees in colder environments will perform better if the boots can handle the cold. Consider a boot’s comfort rating for temperature compatibility to make sure they will protect your workers. Keeping your employees warm in a refrigerated or freezer environment is a no-brainer, and the warmth of the gear selected was likely a top concern when choosing which jacket(s) to provide your employees. But for processing plants, jackets should be non-porous to reduce sanitation concerns and avoid cross-contamination from absorbing bacteria-laden liquids. Even better is water-resistant or waterproof material as an added measure of protection. You must also consider what is inside a jacket. For example, if you choose a jacket with down insulation inside and the jacket rips, then the down material will spill out, spread and contaminate your product. Synthetic insulation that binds well and does not spread should be considered, but as a first priority, consider a jacket that has a tough tear- and rip-resistant outershell. For the same reason, you will also want to avoid jackets with fleece- or faux-fur-lined collars. When looking at your sanitation and anti-cross-contamination efforts, it is important to consider every factor, including the gear and equipment your employees wear. Investing in gear that works towards your sanitation efforts, instead of against them, saves you time, money, and stress in the long run.